Travel was once the epitome of glamor. People dressed in their finest clothes to go to the airport. Ships and planes were things of luxury. In that era, the posters and brochures that advertised luxe journeys were just as lovely as the journeys themselves. Fast forward to 2013, and travel is expensive, crowded, and invasive (we're looking at you, handsy TSA pat down). 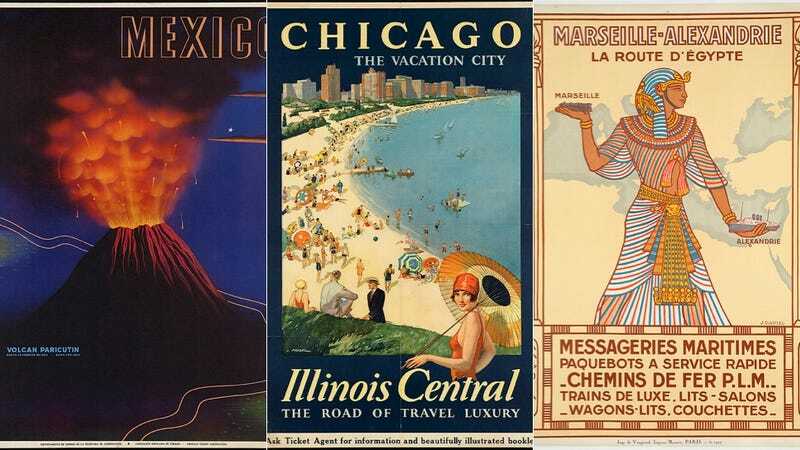 But forget for a minute where things are now and remember what things once were, through the lens of these beautiful, artful travel posters of yore. Artist Robert Falcucci created this 1932 advert for a French vacation. It looks like a piece of pop art. This early 1900s poster is a reminder that France has an unfair advantage in the beauty, culture, and scenery department. This poster depicts jet travel as a heavenly experience—with none of the crappy peanuts and bad service that await you today. Yes. Yes we would have been enticed to go to the 1936 Olympics. If only the whole Nazi thing hadn't been a factor. This captures exactly what you'd imagine the French Riviera is like in person. You can go fast as hell on the Autobahn, as illustrated in this tourism poster by German artist Ludwig Hohlwein. Artist Dorothy Waugh touts what Ken Burns called America's best idea.